Police investigating the murder of a woman in south-west London are looking at possible links to the killing of a teenager in the area last year. Amelie Delagrange, 22, a French national, was found with a serious head injury in Twickenham Green on Thursday. 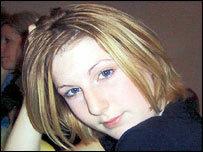 Marsha McDonnell, 19, died after being struck on the head in nearby Hampton in February, 2003. Police are also investigating an attack on a 34-year-old woman in Twickenham in April, it has emerged. A police spokesman said: "The possibility that the murder may be linked to other incidents in Twickenham has neither been ruled in nor out at this stage, and the investigation is being looked into carefully. "Our focus remains on this murder, and we appeal to anyone who thinks they may have seen the woman in the vicinity of Twickenham Green, or seen or heard anything suspicious, to call police." Officers on patrol were flagged down by someone who had found Ms Delagrange near the cricket pitch on Twickenham Green. She was taken to hospital but pronounced dead at midnight. Ms Delagrange lived and worked in the Twickenham area. Police said she was in Crystals Winebar on London Road, in Twickenham, with a female friend, on Thursday evening. She then caught the 281 bus at about 2130 BST heading towards Hampton. She was alone when she got on the bus, thought to be in the London Road area. Police are appealing specifically for anyone who saw her on the bus, or saw her get off probably in the Twickenham Green area. 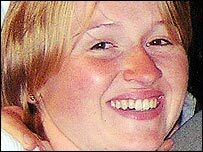 Ms Delagrange is described as white, with shoulder-length blonde hair, and was wearing a red top and white trousers. The 34-year-old woman attacked in April had been drinking with friends at Harringtons restaurant, police said. She was found by a passing motorist in Hampton Road near the junction with Twickenham Green suffering from a head injury. Police said the woman had no recollection of her movements since leaving the restaurant and had still not regained her memory of the incident. "Police believe someone must have seen or heard something"